Muscle Confusion, The Best Way to Maximize Results. So, you’ve been working out for some time and are really starting to see results. Then, suddenly, you can’t seem to make any improvements to your fitness level. Your workouts seem easier and your body isn’t as sore the next day. Plus, your muscles simply aren’t growing. What is the cause of all this? The answer is simple: boredom. Even though your mind may not be bored by your workout regimen, your muscles probably are. If you consistently do the same exercises week after week, you are bound to hit the dreaded workout plateau. To fix this, you need to keep your muscles interested in your workout. How can you do this? Well, you can confuse your muscles by varying your workout routine, Muscle Confusion. In addition to challenging your body and promoting bigger gains, muscle confusion can also protect against injury. If you consistently perform the same routine, you will always be working the same muscle fibers. By altering your moves, you can strengthen your muscles from new angles. This helps create a balance in strength that will protect you from sprains and other overuse injuries. The big thing to remember when trying to confuse your muscles is that you want to keep working the same muscles just in a new, different way. For example, you may switch from a regular bench press to a chest press with dumbbells. You can do this with any muscles by simply switching between designated machines, cables, resistance bands, and free weights. In addition to changing your moves, you can also change other variables in your workout. For example, you can add or remove a set and change the number or repetitions done. Similarly, you can change the weight you lift for a particular move. Alternating between a lower weight (10-12 per set) and a higher one (6-8 per set) on different days can really challenge your body. Most experts recommend varying your routine at least every four weeks to keep muscles confused. Remember, there are hundreds of exercises out there. So, you should never feel trapped into your existing routine. If you are stuck trying to find some new moves, try surfing the web or asking a personal trainer. You can also swap routines with fellow fitness buffs. Even better, choose a workout program that is specifically designed to confuse your muscles week after week. Choosing a program specifically designed for muscle confusion is my personal preference. Fitness trainers like Tony Horton with P90X and Chalene Johnson with ChaLEAN Extreme, are excellent choices. These programs vary your workouts to maximize the Muscle Confusion concept, which in turn maximizes your results! As with any fitness program, practicing muscle confusion requires certain principles be adhered to. First, make sure you utilize proper form for maximum results with minimal injury risk. Also, be sure to give your muscles time to rest between workouts and fuel up with proper nutrition. Remember, just because your routine changes, doesn’t mean your healthy lifestyle should too. 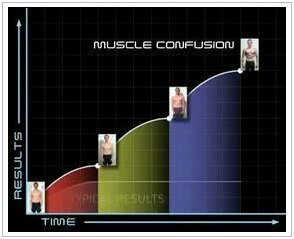 For more information on Muscle Confusion, watch the P90X Muscle Confusion video. PreviousMuscle Failure, Get in Shape by Failing First.